Ellorine did such a beautiful job with our wedding cake. The design came out exactly how i asked and the flavors were so delicious, the texture of the cake was perfection, i wish we had left overs. Everyone enjoyed the cake people were going back for seconds and thirds. On top of the phenomenal cake, she was wonderful to work with. Very professional, responsive, and sweet. She would send me texts a few days before my wedding just to reassure me that everything is taken care of and to not stress. I would definitely use her services again and recommend her 100000% ❤ thank you very much! Tiffany, thank you for such kind words and the feeling is definitely mutual. You were also great to work with and very organized. From the begin, you knew exactly what you wanted and the result was totally beautiful. I definitely look forward to working with you again. Thanks. Sweet kreations best service ever! After so long researching finally found Sweet Kreations!. What an amazing experience.! Not only Ellorine (owner) captured our vision and brought it to life but she also made it in such a classy and elegant way !. If you are looking for an incredible design, out of this world flavor and affordable prices , this is the company u need. Everyone in my party loved the cake. I couldn't decide on 1 flavor so i had 2 !!! Chocolate cake with chocolate fudge filling and vanilla cake with CHEESECAKE FILLING !!!!!!! YES !!!! People kept asking for more !! Planning a big party isn't cheap and 9 out of 10 STRESSFUL. Well, Ellorine made the cake process a pleasant one. Not only you won't find a better price ( TRUST ME) nor better service, flexibility , amazing customer service somewhere else. I'm so happy I found Sweet Kreations! Thank you Veronica for such an amazing review. It was really great working with you also and I really look forward to working with you again in the future. Thank you so much. We hired Sweet Kreations to make us a wedding cake for our wedding. My wife had an idea of what the cake should look and taste like. Ms. Jershun made it come through. She made our decision easier by emailing us photos of wedding cakes and communicating with us via phone calls and emails. Our cake looked exactly how my wife pictured it and tasted great. I highly recommend Sweet Kreations for all your cake needs. Thanks David. It was great working with you both and I look forward to working with you again in the future. If you’re getting married in the Tampa area, don’t hire anyone other than Sweet Kreations! Ellorine is the best. She will make your vision come to life and it will taste amazing! We had a 3 tier cake for our wedding. We chose the bottom tier of Vanilla with strawberry filling and vanilla buttercream icing, the middle tier of lemon cake with strawberry and lemon buttercream icing and the top tier of key lime with key lime custard and key lime buttercream. Yes, we are huge key lime fans! My guests were raving about how delicious the cake was. Thank you Ellorine!! You are welcome Beatriz. It was great working with you too. I am very happy you and your guests enjoyed your cake and I certainly look forward to working with you again in the future. Thanks again. Ellorine was an awesome person to work with from start to finish. I did not have an actual design for the type of wedding cake that I wanted, but told her the colors as well as the theme for the wedding and she was able to give a design based off of that. We went with the marble cake, in which was very moist and delicious. Everyone was bragging how good the cake taste and how beautiful the designed looked. She did text me the day of the wedding to wish me a Happy Wesding Day! I would use Elllorine in the near future and appreciate her punctual and awesome customer service that she shows. This shows that she truly love making cakes and putting her all into it. Go with Ellorone you will not be disappointed!! Shanta, thank you so much for your great review. It was wonderful working with you also and I do look forward to working with you in the future. Thanks again. The photo on the left was the example provided to Ellorine and the photo on the right is the finished product. My client’s were ecstatic with how the design came out. Additionally everyone loved the cake, not one piece was left. The cake was fluffy and delicious, she really did an amazing job. Thanks so much for such kind words. I really appreciate working with you and your clients and look forward to many more in the future. I cannot day enough great things about Ellorine, she was a true professional. From our very interaction I felt really good about choosing her as our cake maker. The tasting blew our minds. Could not stop thinking about how great cake tasted and only dreamed about it more waiting o. Our wedding day. When everything was finally done and said she really did any amazing job. As professionally trained chefs (yes the both of us) it takes a lot to really wow us. We were truly over the moon satisfied with her services. She was great at communication and never left you feeling unsure about anything. 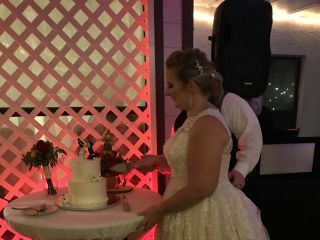 Our cake turned out beautiful... and I can’t wait to order something from her again! Thank you sweet Kreations for really exceeding our expectations. Thank you Talisha. You both were so great to work with and I am so happy you enjoyed your cake. I am really looking forward to working with you again. Ellorine is such a beautiful human being that has a talent a creating equally as beautiful cakes. During our wedding planning time, my mother fell in and in the hospital. Ellorine reached out to check on the status of our contract signing, and once she was informed of my current family healthy difficulty, she checked in with me often - not anything cake, contract, or payment related. But just on how my mom and I were doing. Her cakes were delicious and everything we could ask for! Thanks so much for you kind words. You were great to work with and it was my pleasure. I look forward to working with you in the future. 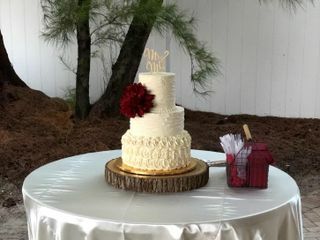 Ellorine is phenomenal...I want to thank sincerely for the beautiful wedding cake you created for my brothers wedding. Not only was it absolutely beautiful it was so, so delicious too! You were such a pleasure to work with and very accommodating. I will recommend you to everyone I know and hopefully will be using your wonderful services for future events! Thank you again for everything! Sue, thank you for such kind words. You were a joy to work with also and I really look forward to working with you in the future. That's a beautiful picture! Thanks again. Thank you for such kind words. The feeling is mutual Roselyn. You were also really great to work with. I wish you both a Blessed and Wonderful life together. Thanks again. Ellonoire was amazing she did both my bridal shower and wedding cake I couldn't have found a better person to trust with my special days. Both of my cakes were delicious. Everyone loved it they were all gone. As well she is very professional and understandable. I don't have more pictures yet of my cake but it was amazing. I highly recommend her services!!! I've attached pictures. Ilse, thank you so much for your kind words. It was really wonderful working with you too and I'm so happy you were please with your cakes. Looking forward to working with you again in the future. Thanks and have a Blessed life together. My cake was made so well. She listened and put every detail we requested in without a doubt. The response time and understanding towards a stressful bride was there without question. I changed my design like 5x’s and she accommodated without making me feel bad, lol. I will definitely work with her again. Thank you very much for your hospitality. Thank you so much for your kind words Melanie. Although we never met, it was truly a pleasure working with you. I look forward to meeting you one day and working with you again in the future. My experience was absolutely perfect from the beginning to the end. 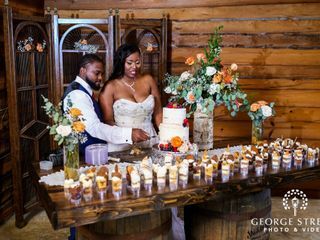 The first time we met at the cake tasting, I could already tell that Ellorine was extremely passionate about her cakes and she desired nothing more than to serve up everything we wanted and more! She came prepared with design ideas and they were all so creative. The cake itself...to die for. 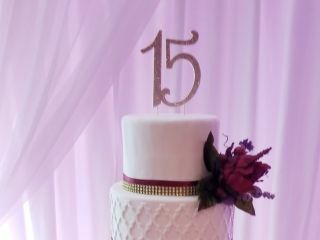 She was able to pull off 4 different cakes in each layer and her Jamaican rum cake...I would eat it every day if I could! Not to mention that she offered to make a separate cake for my nephew due to his allergies. You cannot get much better than this! Thanks Zabrina. It was truly a joy working with you too. Looking forward to working with you again in the future. Ellorine was awesome!! The cake was just as good, if not better than the tasting (which was AMAZING!)! All of our guests raved about how moist and delicious our cake was!! It was decorated perfectly and the roses matched exactly to the swatch I sent! Thank you for the perfect cake!!! Thanks for your kind words Kathy. I am so happy you enjoy your cake and that the sugar roses matched your wedding color. It was a joy working with you and your Mom, Kathy. I look forward to working with you in the future. Ellorine was amazing! She created a beautiful cake with cupcakes that matched. We told her what we wanted and she made it happen. We were impressed with her attention to detail and professionalism and we would hire her again in a second! Thank you Tania. It was great working with you and I look forward to doing business with you again in future. Ellorine was fabulous! She had so many good ideas and I really appreciated the fact that she was patience with me. The cake came out better than I had imagined and my parents loved their Anniversary cake. I can't wait for her to do my wedding cake! Thanks Brittany. It was really great working with you. I am looking forward to working with you again on your wedding cake. Congrats again! Thanks for your kind words Tameka. It was truly a joy working with you and Marvin for your wedding and birthday cakes, since then. I look forward to working with you both again in the future. Thanks. Sweet Kreation cakes are AMAZING! Our wedding cake was extremely moist and full of flavor. Each tier of cake was a different flavor/filling and we were not disappointed. I called many places -for a basic flavor and filling they all started at around $7 a SLICE which we found outrageous. Ellorine was much less. Affordable AND delicious. You will not be disappointed! Thank you for such kind words Melanie. It was a pleasure working with you. So happy you enjoyed your cake. I cannot say enough about how wonderful my experience with Sweet Kreations was. I contacted Ellorine with a somewhat short notice and even had a ceremony/reception venue switch AFTER that, yet she was always on top of things. She was patient with me and understood exactly what I wanted. She is very intuitive and is able to anticipate customer's needs. The cake was delicious. My guests raved about both the taste AND how adorable it was. Not only is the service and quality outstanding, but I truly feel I can call Ellorine a friend after this experience. She would call during the difficult times of the wedding planning process, and provide support and encouragement, and in general just make me feel better. You won't find a more friendly, caring, generous, and supportive vendor. My husband and I are so glad we chose Sweet Kreations. You will be too - trust us! Melissa, thank you so much for such a wonderful review. 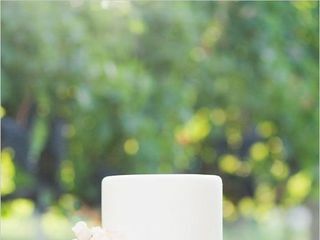 I know its difficult planning a destination wedding and my goal was to ensure that the stress of such experience was reduced as much as possible. The feeling is completely mutual and I really enjoyed working with you too. Yes, you are definitely a friend to me too. Please stay in touch and I will do the same. Have a blessed life together. Our cake was absolutely perfect!! It was everything we had imagined and it tasted amazing! 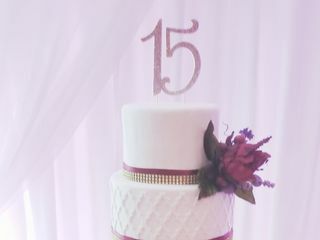 I would highly recommend Sweet Kreations for any of your cake needs! Thank you so much!! Kayla, thank you so much for such kind words. I am so happy you were pleased and it was a pleasure working with you too. Congrats again and have a great life together. I loved my cake. I recommend Sweet Kreations to everyone. I put all my faith in her and she delivered 110%. Everyone at my wedding said the cake looked beautiful and tasted great. I'm so happy my husband found you. Windie, thank you for such kind words. I really enjoyed making your cake. You and Kevin were such a joy to work with. Have a blessed life together. Thanks again. Sweet kreations made my wedding day complete. Once my cake arrived I was in complete awe and relaxed. She (Ellorine) took her time and handmade my pengiun toppers her work, talent, and skills on my poker themed topsy rurvy cake was AMAZING. She was always on top of things and suprisingly open to my idea of using penguins and offered to handmake the poker themed to match my cake.We returned from our honeymoon and people were still inquiring on having yet another slice. 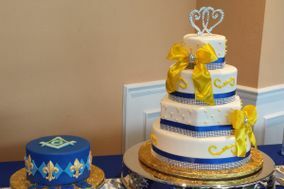 My husband and I cant wait for the day to ask Ellorine to make our baby shower cake. THANKS SWEET KREATIONS! Thanks Stephanie. I really enjoyed making those penguins. Your wedding theme was very unique and fun. Yes, I will be waiting for the baby show cake :-) Congrats again! 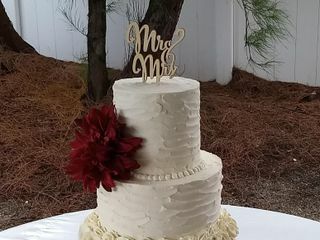 Sweet Kreations did such a great job with my wedding cake and my husbands grooms cake. Absolutely flawless and delicious!! I would have her make me another cake any day!! Thanks Alexandria. It was such a great experience working with you. Hope to work with you again in the future.